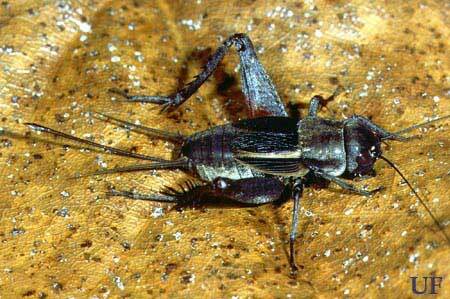 The taciturn wood cricket, Gryllus ovisopis T. Walker, is noteworthy in that it has no calling song. Males and females find one another for mating without long-range acoustic signals—as in most other insects. The taciturn wood cricket occurs throughout the southeastern coastal plain and as far south as Highlands County in the Florida peninsula. Figure 1. U.S. Distribution of the taciturn wood cricket, Gryllus ovisopis. 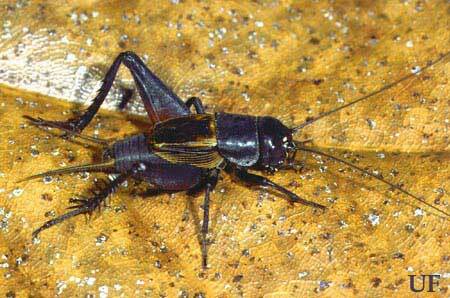 The taciturn wood cricket is blacker than other species and has shorter, generally darker forewings. The length of the forewings is less than twice the median length of the pronotum. In this species the hindwings are never developed for flight. The stridulatory file of the male is shorter than that of the sand field cricket, and has the file teeth closer together than in the southern wood cricket. The ovipositor is more than 1.3 times the length of the hind femur. Figure 2. Adult male taciturn wood cricket, Gryllus ovisopis T. Walker. Photograph by Paul M. Choate, University of Florida. Figure 3. Adult female taciturn wood cricket, Gryllus ovisopis T. Walker. Photograph by Paul M. Choate, University of Florida. This species overwinters as eggs in the soil. Eggs hatch in April, and development to the adult takes about six months, with nearly synchronous maturation in mid September. This concentration of adults must help sexual pairs to form without the aid of calling songs. There is one generation per year. Woods, though adults may wander into adjacent open areas. Most often in moist broadleaf woodland and in loblolly pine woodlands (a late stage in old-field succession of sites that were once broadleaf woodland). This is the only field cricket that has no calling song. Males have the forewing specializations for sound making and use them to produce both fight and courtship songs. Walker TJ. 1974. Gryllus ovisopis n. sp. : a taciturn cricket with a life cycle suggesting allochronic speciation. Florida Entomologist 57: 13-22. Walker TJ. (2011). Taciturn wood cricket, Gryllus ovisopis T. Walker 1974. Singing Insects of North America. http://entnemdept.ifas.ufl.edu/walker/Buzz/476a.htm (23 September 2011).